After many hours browsing the AMAZING graphics other people have made, i was inspired to make some of my own!! 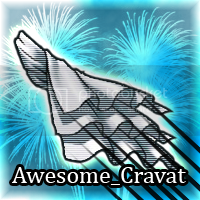 Last edited by Awesome_Cravat on Thu Jan 05, 2012 2:42 am, edited 12 times in total. Wow, your graphics are really cool! 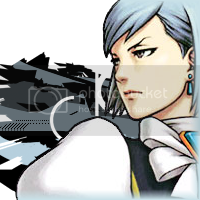 I really like the Franziska signature, it's pretty. Pearly Fey looks very cute. I'm looking forward to seeing more of your graphics! ^_^ Thank you. I'm still getting to grips with photoshop so hopefully future graphics will be better! To me it seems like your graphics are already awesome! I love the "Manfred von Karma Straight from the jaws of Hell" one! That made me laugh a lot! Your sigs are awesome! How 'bout showing us some avis? I'm sure they'll be great! These are really nice! Have you tried using layer blending modes? They really add depth to your graphics, especially when applied to brush layers. You're too kind!! ^_^ Have a cookie!! I am hoping to do some avi's in the future!!! 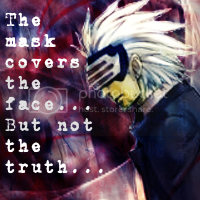 maybe to match the sigs i've already made. Mabye some stand alone ones. How do you do that? 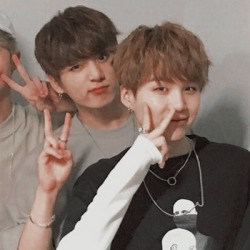 as i said before im still learning photoshop! You can set layer blend modes on the layers panel. It's a small scrolling menu in the top-left bit. Right now, all the layers in your works are probably set to 'Normal', but you can mess around with them (setting brushes to Overlay looks particularly pretty). Wow! These are good! Make more! 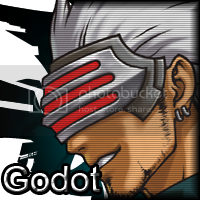 So here is one more sig and a handful of avatars!! 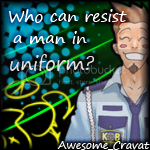 "Who can resist a man in uniform?" 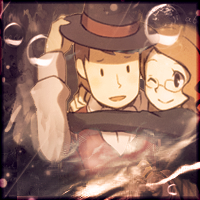 I love that avatar! It made me laugh out loud. 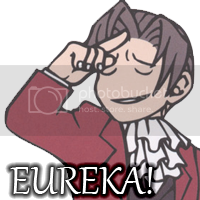 The Franziska avatar is pretty, and the stars in Mia's avatar are great! The signature is very cool. For a starter your art is pretty good. I have no idea and no inspiration as for graphics and your ideas are great. I shall make bigger avvys! and between you and me, i find inspiration for my graphics really difficult. 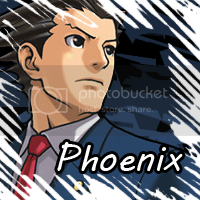 I literally sit at my computer and just play with brushes, colours, fonts and layer effects (thanks to midnight jasper ^_^), until something catches my eye and makes me think...hmm yes. Either way i'm glad you like them! And i plan to make more Manfred graphics in the future! 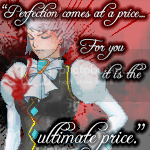 In particular, the Franziska von Karma one is amazing. These are very nice. I like the Franny one a lot. I can not wait to see more. My favorite is the "Who can resist a man in uniform?" These graphics are amazing, I really like the style of them. Keep up the fantastic work, I really look forward to seeing more! Wow! Thanks everyone ^_^ I'm still learning all the different effects i can achieve with photoshop so hopefully i'll be able able to improve on these! In the mean time, here my newest sig!! I really like the new signature. Especially since the colours suit the 'mood' of it. Woah, it's so cool! 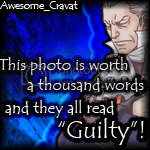 I love it especially von Karma's face. 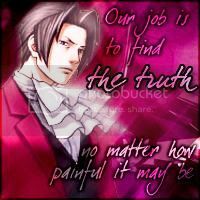 A few things; Edgeworth seems a little too bright compared to the rest of the picture, and the tiles in the background break up the faces of Edgey and von karma. But they're not major things, so don't worry. A non PW related sig O_o! - use the pencil tool to fill in the bottom square. I find the best effects are either reducing the fill to about 50% or using a clipping mask and setting the layer style to overlay ^_^! Hoped that helped and have fun making patterns!! Greetings from Austria (yeah, I'm Austrian .. xd )! Ok so here are a couple of new sigs i've made. I made these as requests for members on another forum but i liked them so i'm posting them here ^_^. Unfortunately these sigs are not avaliable to be used, but still i hope you like them ^_^! Thank you to everyone for all your kind feedback!! Tis greatly appreciated!! ^_^!! I'm hoping to start making some seasonal sigs soon ^_^!! These are really good, I can't explain why but they are really good, keept it up! Thank you for all the nice feedback! 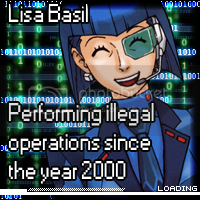 And on that note, a Lisa Basil Avvy! Anybody want to see any particular characters in avatars?? O_O Its not a PW sig!! oh thats nice :3 thats really good, i like it ;) kepp up that good work!